History is full of individuals who made a difference in other people’s lives. 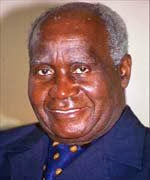 Kenneth Kaunda is one such individual, highly revered around the world but not fully appreciated by his own people. As I travel around the world, the first person people want to talk to me about when they realize I am Zambian is Kenneth Kaunda. Many political figures are actually represented in the media but not so much for Kenneth Kaunda. What has been even more saddening is the remembrance of Africa Freedom Day weekend during my childhood. It epitomized the sacrifices that Zambia made for the whole Sub-Saharan Africa helping our neighbors fight for their own independence and Kenneth Kaunda was at the center of the storm but today he is almost forgotten. I searched Facebook just to see if any body had come up with a group to remember the true son of Africa but none was found. Not so for other nations, I said to my self. Not so in any other part of the world. So, I answered the call to create this group “President Kenneth Kaunda” for others with common interest in a politician who helped change the face of the Africa thereby changing the geo-political strata of the entire world. Welcome aboard … in honor of the first President of the Zambian Enterprise, Dr. Kenneth Kaunda; thanks a trillion.